was established in 2007 by Alan Levenson and Karen Morris, Esq. to recognize and perpetuate Mr. Fortune's contributions as a passionate teacher and mentor of school-age music students. Mr. Fortune taught their son Josh Morris Levenson piano for many years at Christina Cultural Arts Center Inc. A multi-talented composer, record producer, performer and educator at Drexel University, Fortune has been on faculty at CCAC for 20 years. This scholarship provides tuition for a comprehensive, individualized full-year course of study for an aspiring middle school or high school musician with demonstrated instrumental proficiency and a commitment to jazz study. Study may include private instruction on the scholar's instrument (including voice); music theory; jazz history; improvisation; composition; ensemble performance; understanding the music business, technology and recording. This year's scholarship recipient is Pyerce Oates, a 14-year-old student at Cab Calloway School of the Arts. Pyerce first became associated with CCAC as a participant in jazz residencies at Cab Calloway presented by violinist John Blake, Jr. and saxophonist Javon Jackson. In 2012, Oates was a featured artist during the DuPont Clifford Brown Jazz Festival to premier his original composition,The History of Black, Brown and Beige. Oates begins his studies as a Dennis Fortune Scholar this fall. Humble Beginnings, on G-Records in February 2009 at the age of 9. In 2011, Pyerce released is second CD, A Dad Is Like A General. The compositions pay homage to all the loving fathers in the world who are committed to their children. The title song - A Dad Is is Like A General - was inspired by the father/son duo's experience in the Delaware talent contest, Me & My Father Have Talent Too. Pyerce has received numerous awards: the Newark Delaware NAACP for Youth Community Service; Outstanding Soloist Award from the University of Delaware's Jazz Festival in 2011 & 2012; and Outstanding Accompanist by Music in the Parks in Hershey, PA in 2011 & 2012. Pyerce has been a guest pianist for Governor Jack Markell's annual holiday event at Buena Vista. Pyerce is a member of the Wilmington Youth Jazz Band, the August Quarterly Choir, and the Jazz Band & Jazz Combo at Cab Calloway. 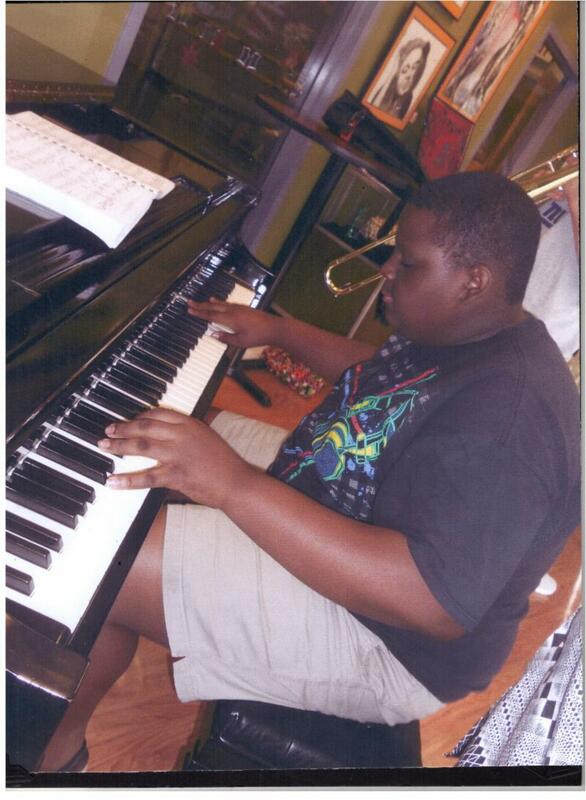 He recently performed at the Tony Williams Scholarship Jazz Festival in Philadelphia. Our launch in 2012 was inspirational and informative; the 2013 program promises even more! 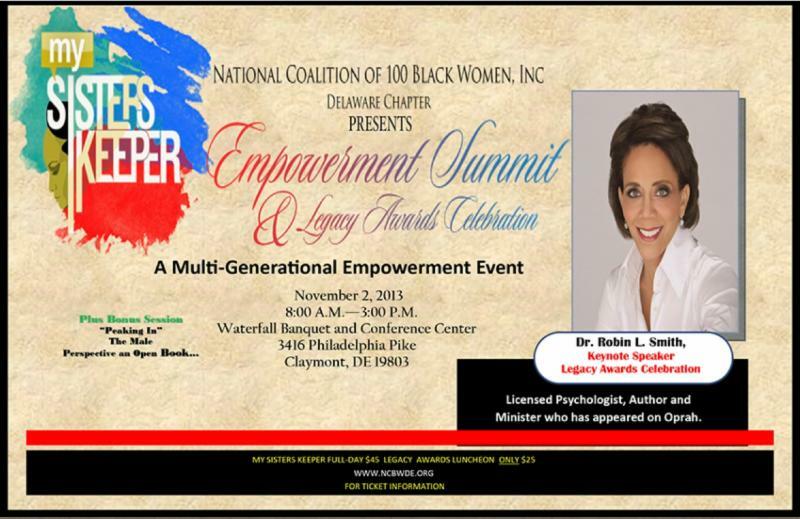 Our keynote speaker is noted author and psychologist, Dr. Robin L. Smith. A feature conversation with multi-generational brothers -- "Peeking In On the Male Perspective" -- has been added. Please share this information on your e-lists, company e-news, social media and encourage your friends, co-workers, and church members to attend. We also want to encourage school-aged girls (ages 12 & up) to attend. We promise you won't leave like you came! Christina Cultural Arts Center Inc., Revive the Village A United Way of Delaware African American Initiative & the people of Wilmington celebrate the Christmas holiday in its true spirit. "Carols in Color," based on the gospel according to St. Matthew, re-tells the story of the birth of Christ with exuberant dance, contemporary music and powerful narration. 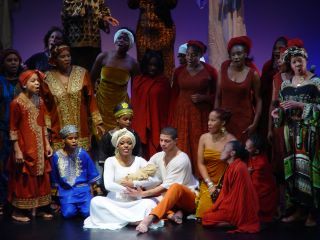 Carols is cross-cultural, non-denominational and brings audiences to their feet! Carols is conceived by E. Leon Evans II. Meet Shawn Lamere Williams, Artistic Director, Dr. Shelia Ward, Executive Director and the Colors Cast immediately following the performance.